While port forwarding is a somewhat technical subject and understanding the actual programming behind the subject would be a daunting and time-consuming task for anyone, the answer to what is port forwarding, the actual usefulness of the process, and what it does it fairly simple. Port forwarding is a system that translates the information from your router and sends the information where it needs to be. For most users, the device doing most of the port forwarding will be their own household router or the one they have in their workplace, that connects all of the devices to the same place before forwarding that information on. While the devices will have unrestricted access to the private network and see the specific device’s IP addresses, any device outside of the network will see only the external IP address of the router forwarding information. Some people will notice the difference between this system and a VPN, but there are some key differences that pick apart this service from regular port forwarding. 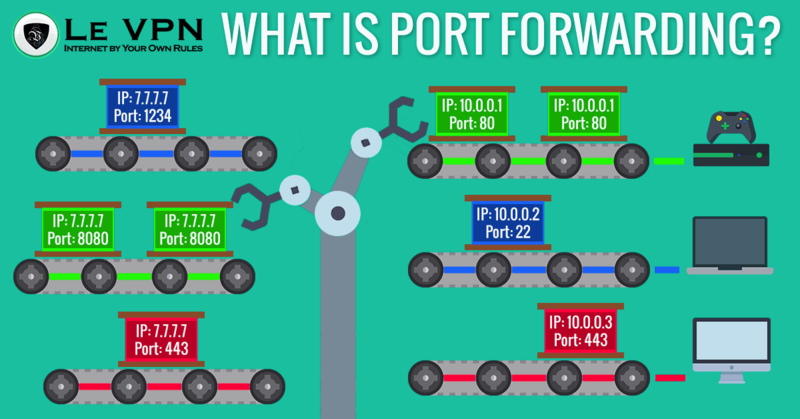 The best analogy to understand what is port forwarding would be with an actual shipping port. If you need to send multiple packages to multiple different places, it is much easier to place everything into a shipping container and transfer to a convenient location in bulk, than to send every package separately. In this analogy your device would be the sender, the content you wish to access the receiver, and the router would be the large shipping port that is in the middle of the desired area. To understand this process better, as well as all of the benefits and risks that come with it, it would be best to know more about what your modem does, as well as your router, and any device receiving the information. But, those who just want to reap the benefits of both using port forwarding and using a virtual private network (VPN) can opt for hybrid networks (HybridVPN) provided by Le VPN, which is much easier to understand that the inner workings of network connections. In most cases, IP port forwarding is used to send information from devices that are outside of the network to a specific device inside your network. To make an example of what is port forwarding, when you are using your PC to play an online game, the server the game is hosted on doesn’t actually see your PC specifically, but rather your router and the IP stated by it. Then the router receives the information and forwards it on to your PC, progressing your game. Although the original reason for port forwarding was to improve the communication between the internet and all of the devices connected, there are some added benefits to this system that shouldn’t be overlooked. Primarily it is security, as your router could be installed with a firewall that will block all malicious connections from accessing your devices, as well as mask the exact IP of your device with the one of the router. Additionally, this allows the administrator of the system to block any website content that they don’t want someone to access, such as in child locks or businesses blocking social media at the workplace. Creating a block port rule manually is quite easy if you have access to the router, as you only need to enter the number of the type of port you would like to block. There are several different types of port forwarding depending on the type of solution needed. Currently, most ports are uniform, making the same number always access the same service. This serves a dual purpose as it quickens the process and reduces lag time, as well as provides additional protection for devices that want to access the port without the proper background. This way it is impossible for your connection to be tricked to offer data to a port that is not required by the service. Any established network connection will have a ‘’port’’ included as a designation what the content on the other side is supposed to be. Using a port number, your computer, or any other device, will know what type of packet it is. The Internet Assigned Numbers Authority or IANA has specified standard port numbers up to 1023 that is specified to be for certain uses. One of the commonly used port numbers are Port 80 which was used exclusively for hypertext transfer protocols (HTTP), which is most of internet traffic such as web pages, but will gain an additional use to transfer QUIC, or Quick UDP Internet Connection, which is a novel type of a transport layout network that should greatly increase the efficiency of data transfers. But, what is port forwarding is slightly different when you are using a VPN. Some professional VPN providers like Le VPN offer a hybrid VPN system where any information that is considered safe or is using a port that will not send out information about the IP address will be routed directly, providing greater internet speeds, while all others will be secured by a VPN connection. Most routers will have an internal feature included called the ‘’Demilitarized Zone’’ or a DMZ, which is primarily used as a security configuration for a given network. On some routers, especially those found in the home, this system will be referred to as ‘’Faux-DMZ’’ as it will not have all of the features included in a regular DMZ. What this type of port forwarding protocol does is simple connection management, letting you simply type in the IP address of the device you wish to forward all of the connections to and it will work on that command. Faux-DMZ forwards is unreliable both from a technical standpoint and in regards to cybersecurity. In some cases, there will be different devices connected to a single router requesting the same information, making the DMZ to either lag or stop working completely. Additionally, relaying information directly to any device will open a vulnerability that could be exploited by malicious persons or software on the internet. The Universal Plug and Play Port Forwards, or UPnP, are quite similar to the regular system with the main difference being that it doesn’t require manual setup. Instead, software inside the network will automatically adjust the router and forward port any information received on a given port to it. Once the connection is established, this router works in the same way as the regular one. Most VPN servers use this type of forwarding in their applications, as it is much easier for the user to delegate the setup to a program than to insert the port configuration by themselves. As to gain some better understanding of what is port forwarding as a system, it is important to mention all of the devices around the forwarding port that are impacted by the information that it is transferring. From the device you are using to browse the internet, to the content you are trying to reach, the forwarding port is just a single piece in the very middle of the system, but it is essential to the functions of the internet as a whole. Additionally, knowing the frame of the system will allow you to protect your system better as well as to troubleshoot in case you ever have an issue. Depending on the year you are reading this, a device you are using to browse the internet may vary greatly. In the years past, this would exclusively include your personal computer. Currently, this includes smartphones, tablets, laptops, consoles, as well as a long list of devices that are included in the ‘’Internet of Things’’. Your device will send out a packet of information telling your router where to send the request. The router will create an open port and decide on the forwarding number depending on the content and contact the local machine where the content is stored. Finally, the content will be requested and will start sending information back. While this line might seem long, as all things are literally happening at light speed, the response time is measured in milliseconds. The router will take the connection request made by your device, also called a SYN request in TCP/IP, and change the return address, switching it from a private IP used by the network in question to the public IP address used by the router, using that address as the final return signature of the request. The request is then noted into the internal database of the router, also called the NAT table, so that it will know to which device it should be sent once the information is returned, performing port mapping to save time and increase efficiency. When the requested content returns from the remote computer (the ‘’SYN-ACK”), the signature will be compared to the NAT table and connected from the hosting computer to the device on the private network that has initiated the exchange. The router will perform an open port check tool to verify that everything is in order. Finally, when the connection is terminated by your device, the router will just remove the note from the NAT table, opening it for another connection. Finally, new routers can enforce port triggering to allow a server to forward a specific port back to itself automatically with a dynamic port. While there is mention of changing IP addresses by your router here, this is not the same as having a VPN. The IP address provided by your home router will still be connected to your name and other personal information and should be considered as your IP address. Any malware will be able to target your devices by using the IP address provided by your router. If you want to mask your IP address, you will need to use a VPN connection. The forwarding port has no physical parts, as it is a set of code inside your router that will assign a number to the packets being sent and forward them onwards to the local machine where the desired content is stored. Local port forwarding is essential to translate the information from the devices on your private network, making them able to go to the internet. For most web pages this will include port 80, but some other designations are quite common, such as port 25, which is commonly used for mail servers, other SMTP systems, as well as some other TCP UDP systems. The local machine is the device storing the content you are trying to access, which is usually a larger server machine. Similar to your own system, the server you are accessing will also have a configuration that consists of a router, also working with a remote port, and multiple devices that need to be forwarded. Only, in this case, the connection will usually be made with virtual machines that will be preset to send out specific port data upon request, making the whole connection faster. While we consider a ‘’local machine’’ everything that is inside the system that stores the content you have requested, the beginning of this machine starts with the router and ends once the request is forwarded to the specific content you are accessing. Here, the request once sent by your device is received, with all the necessary information about the return address. Packets are then sent back the same way, through the local machine that stores the content, back to your router, and finally to your device. Additionally, the packets sent will have the mark of the content being sent, telling your router how to interpret the information and where to forward it. In case that you have a VPN, the return IP address will be the one from your VPN provider. Premium VPN providers like Le VPN have servers in multiple countries, which is 114 in case of Le VPN and will both mask your IP address and provide with some additional benefits of changing your request country. All routers, including the one each of us has at home, have a function called the ‘’Network Address Translator”, or NAT. The last two sets of digits in the IP address provided by your internet service provider (ISP) are selected to be reserved or private. These numbers are officially given by IANA to be used by private networks, meaning all of the devices that are directly connecting to your router, either by an Ethernet LAN connection or via WiFi. Every computer or online device connected to this network will be given a separate address this way via DHCP. These private designations are how different devices in your network communicate with the router. Once the router has the information, it will use the first two sets of digits, also provided by your ISP to communicate with all of the other computers and devices on the internet. Any packets not having these translated addresses and using only the private network address when entering the internet will be instantly dropped as they would create stability issues for the system. Although the NAT will change the individual addresses of your devices to the one that can be used on the internet, this new IP address will still be connected to your system and will hold valuable personal information. This connection is by no meant anonymous or makes your IP address masked. Router connecting with a VPN will engage in remote port forwarding, relaying all the information primarily to the VPN provider. This action done remotely is similar to what is port forwarding when done directly through the router. If you are connected to a VPN, all of the information from your device will be encrypted and sent through the router directly to the VPN server. Once there, the VPN server will change your IP address to the one of the server, masking yours in the process. Every connection will use a NAT, including the one that is connecting directly to a VPN, although the information will be encrypted even for the router in this situation. When this is the sole type of your connection, you will experience the full speed of your connection provided by your ISP, only lessened by the physical restraints of the system. A SmartDNS service is provided by Le VPN to unlock all content from the VPN server without sacrificing speed, which means that you will be able to use the fastest VPN available, being the same speed as your ISP connection. The primary benefits of having a VPN connection are anonymity and security, as well as a lengthy list of other features such as global content access. While the main adversary of your cybersecurity are malicious persons and software, there are also tracking cookies on almost every website today that are made to shower you with adds and other content that you may not want. The important thing to remember is that there is a huge difference between using a proxy connection, a free VPN, or a premium VPN that will be certain to protect all of your devices and keep your IP address hidden from any software. Best VPN providers have realized how to combine the benefits of a VPN protection with the speeds of your router directly communicating with the desired local machine, dividing the IP network traffic between the information relating to your IP address and the series of content incoming to your device. This is especially useful if you are trying to stream video or to play games online, as you will experience much less lag and a smaller ping while staying protected at all times, and your information masked by the VPN provider. When using a hybrid VPN system, there is no need to connect to a remote server, rather using a server nearby with a HybridVPN service. Although port forwarding is one of the integral parts of your experience when browsing the internet, unless you are especially interested in the inner workings of networks it is not necessary to know what is port forwarding for you to have an enjoyable, fast, and safe browsing experience. Premium VPN providers like Le VPN have established HybridVPN connections that will give you the fastest VPN experience without sacrificing any of the security given by the service.